Do you take two bottles into the shower? Do you feel that both rosemary and thyme can help you buff your bum clean? I don't. I just take a comic book created by Robert Venditti and Van Sciver. Want to know why? 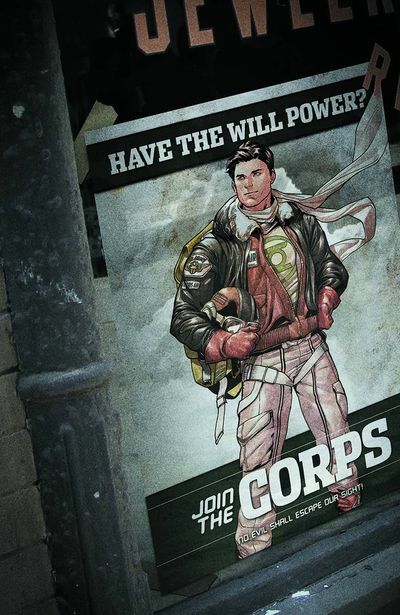 It's because DC Comics are worth it. Especially in August, 2015. To QUOTE Walt Disney: 'Of all of our inventions for mass communication, pictures still speak the most universally understood language'. Now I've got to be honest with you, dear reader, it's taken me a bit of time to figure out how to describe to you this particular issue of Green Lantern. Not because it isn't a well told and well crafted story-line. But because it's overall narrative structure is a bit 'too talky', so to speak, and the vast majority of it is dedicated to people standing around and looking at bold and expansive visuals. Obviously, I do mean this with all due respect. Van Sciver's double page spreads (for which there are plenty) really blew me away. Plus I couldn't turn up my nose at how detailed he drew the expressions and paraphernalia associated with the main cast. What's more, as much as this is an 'all talking issue', what I loved about it the most was how each of the characters showed a lot of character: like Darleen's disdain for Hal (or other organic matter) for instance, or how there is a common bond between Hal and Virgo, namely, how they're both the last of their kind (ish). As a matter of fact, the character development in this story was so good, it kind of superseded the story part of the plot because of it's inane nature. You see, nearing the start, Hal disguises himself in a spacesuit, and clambers out of his spaceship, attempting to speak to his old foe, Relic, who's currently trying to figure out how these anomalies are penetrating the source wall. Thankfully, Relic is more than happy to speak with Hal, and doesn't even recognize him, despite speaking about such subjects as the Green Lantern Corps (mainly, their disappearance), Black Hand, (mainly, how he could be the cause of the anomalies and the destruction of Virgo's home-world), plus his own past time-displaced disposition (for which Hal and the Corps are partly to blame). But of course, in good old fashioned comic book tradition, before Hal and Relic can clearly define the problem at hand (pun intended), something happens (something stupid, I might add), which causes Relic to notice that Hal isn't just a friendly passer by who wants to help out, he's actually associated with his old enemies in the Corps. And it's here, at this juncture of the story-line, for which I have a problem with. Well, Relic is supposed to be a God, right? A very big yellow space-god who's clever and knows how to figure things out. So, why on earth didn't he recognize Hal straight away? Why did it take until the bungling antics of Hal's two pals, back at the ship, to actually make him see the light, and go after him? Also, if you were in Relic's shoes (they must be big, eh? ), and someone just comes up to you, wanting to assist, wouldn't you be a bit suspicious at the least, or ask for their name? Apart from that though, on the whole I'd say this was a very good issue of Green Lantern. The artwork was spot on. The characterizations had character. And the only thing I didn't like was it's jovial yet basic conceit -- speaking with a God, and the God doesn't know you. If you want to know why I'm matching up this comic book to the following Bugs Bunny melody, please read the next section. Back in the day I was a big fan of those Looney Tunes cartoons. 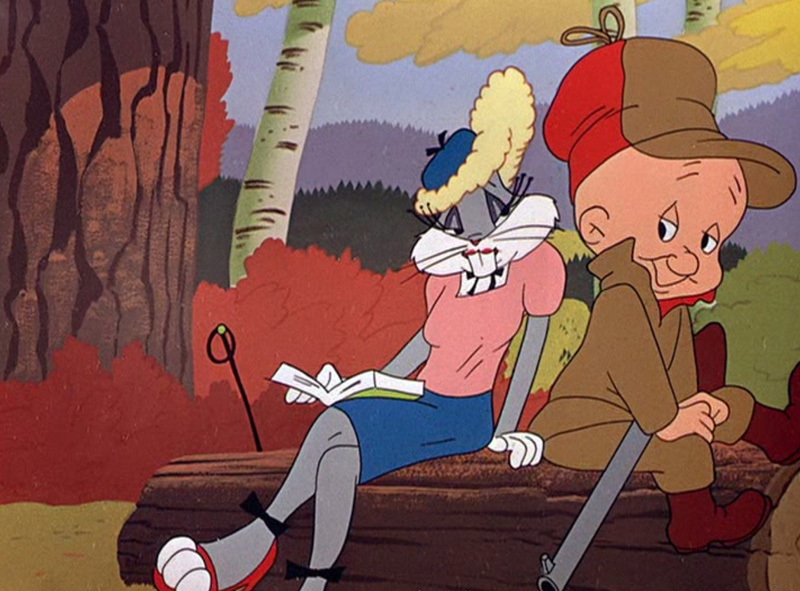 You know, one of those jovial cartoonish capers where Bugs Bunny would dress up as a seductive woman, and mess about with Elmer Fudd. Wait a minute! That gives me an idea! Bugs and Elmer aren't that too dissimilar to Hal and Relic! So... comparison conveyed. 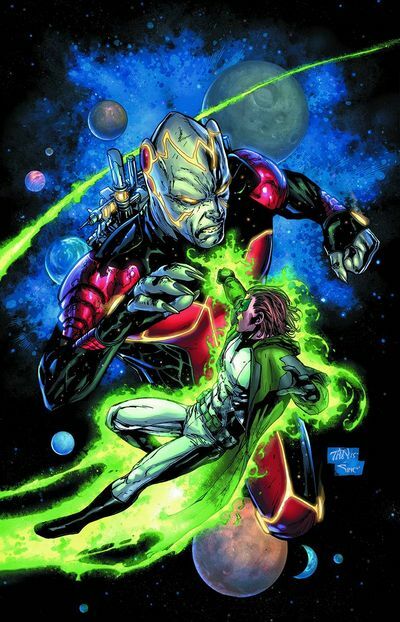 At the very end of this issue it's revealed that Hal is going to soon face a new adversary. So, because you're worth it, how about you try to guess who that adversary is out of the following eight options? Barry Manilow: And his voice of destruction. The Blue Brokers: And their Ipads of wrath. Kim Kardashian: And her selfies of doom. The Grey Agents: And their dynamite of death. Donkey Kong: And his barrels of forward-motion. Bugs Bunny: And his wigs of verisimilitude. The Yellow Factotum: And their things of naughtyness. Elmer Fudd: And his gun of peace.